The Seiko Qaliber Lite RP-D10 receipt printer is an affordable and space-saving solution for a variety of retail and hospitality applications. This cube-shaped printer provides energy efficient and resource efficient printing, great for bars, boutique retail, or places where counterspace is a premium. Minimizing ecological impact with the RP-D10 is relatively easy. 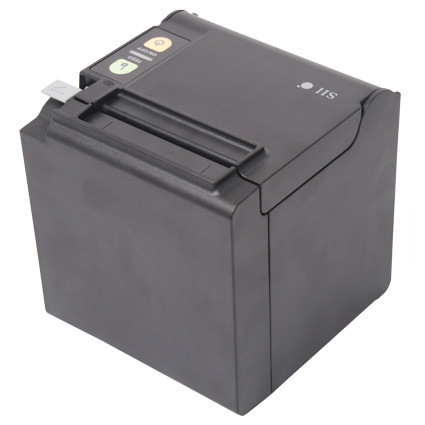 The printer is Energy Star compliant, cutting electrical use compared to similarly equipped receipt printers. Paper use is also reduced by the RP-D10 reducing the top margin to 2 mm. For added paper savings, the printer can be configured to shrink printouts to support 58 mm wide receipts. The 5 inch cube shape of the RP-D10 allows it to provide both top or front feed printing. Front feed allows you to mount the printer under a counter, great for kiosk applications or just generally saving space. Receipts are printed at up to 7.87" per second, quick enough for most retail environments. The printer can change speed, going into a lower speed for better graphical output, or even alternating between quick and slow printing on the fly. Seiko designed the RP-D10 for longevity, using reliable and durable components to ensure top performance. The auto cutter is rated for 1.5 million cuts, while the friction feed system can feed up to 62 miles of receipts. A 2-year warranty is standard, making the Seiko Qaliber Lite RP-D10 a smart and economical solution.